But as I delved further into the subject, it’s much harder than I realized. There’s third person unlimited omniscience and third person limited and, well, there’s a lot to learn. It’s not so easy. Even the best writer’s get mixed up at times. I have read books that have been limited third person (where the main character can’t know what’s going on outside of her realm), but for a brief moment the author forgets and gives us insight to something the main character couldn’t possibly know. A good first person account is hard to write and when you come across a story that writes one well, it is amazing. Tense is an issue as well because even in present tense there is backstory to dredge up and then comes the balance of present and past and it needs to be done well enough that a reader doesn’t get lost in the reading process. Whew! So from here on out I’m going on a learning process and I’m hoping you’ll join me and feed in your thoughts. I’ll post about a book or short story each week. And I’ll list out POV and tense, plus what I feel works and why. The more I do this, the more in-depth my posts will become. These first ones are going to be sparse, until I learn more. Also, in case you’re an author looking for comparable books and who may have published, edited, or agented (is that even a word?) a book, I’ll list those as well in an effort to make the process a little easier. Editor: Amanda Bergeron in the U.S. The story is about a young girl who made a mistake and did the time for it. After serving her time, her and her mother begin their “second chance life” with a new man and his son. Unfortunately the happiness isn’t long lasting and her mother winds up dead. The story is told over the course of a day (a 24-hour time period). That’s hard to do, keep a story entertaining over such a small time frame. The book is told in first person, mulitple points of view from Zoe, Tessa, and Sam for approximately the first ¾ of the book, then we get a fourth person, Richard. He is also in first person POV. Usually, I’ll stick to one paragraph, but with multiple characters having their say, I’m going to give the first paragraph of each character so that you get an idea of voice and style as well. When you don’t have kids of your own, people have a tendency to give you things to look after. I think they assume that you’re lacking in outlets for any nurturing instincts that you might have. It’s a slogan you see everywhere these days, it’s even printed on one of the tea towels that’s draped over the radiator in our kitchen. It might have recently become part of popular culture, but that slogan has its roots in wartime strength and self-sufficiency, and today I vow to be its living embodiment, because Maria’s death is a tragedy that has thrown our family into crisis, and somebody needs to keep their head. This one is pretty simple first person all the way around. It is told in mostly present tense with backstory to fill in for all the characters. The first person was okay, but could have used a lot less: I did, I opened, I saw, I thought. To me it feels like being held at arm’s length so I can’t get close enough to the characters to fully care about them. 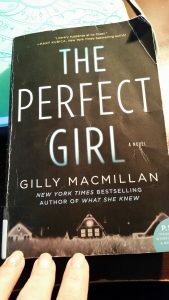 This is an instant where the book was good, but could have been great if it was a hundred pages shorter and we didn’t have an extra narrator that really added nothing to the story. Have you read the book? What did you think of the Sam Narrator?